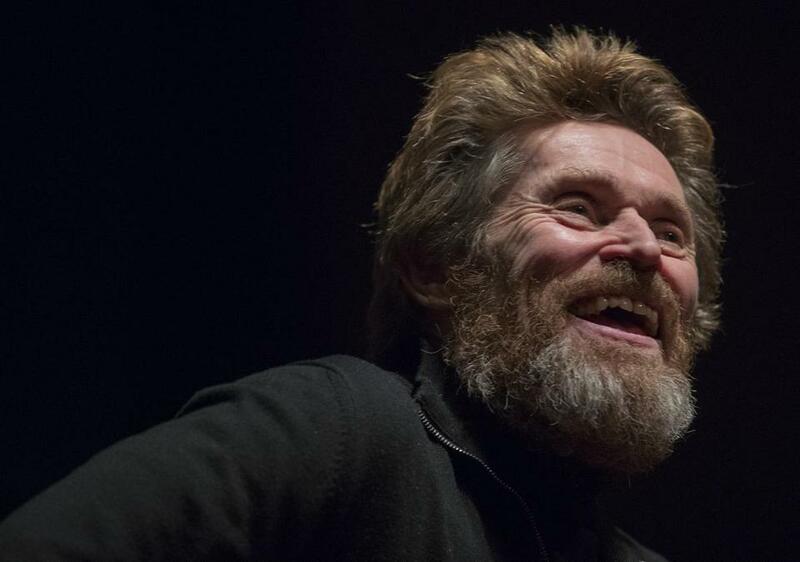 Oscar-nominated actor Willem Dafoe at BU Monday night. Willem Dafoe has received all manner of kudos for his Oscar-nominated performance as a kind-hearted motel manager in “The Florida Project,” including a lifetime achievement award from the Berlin Film Festival. Here’s the problem: He’s not done yet. More than breathing, Dafoe is busy, with two films set to be released this year and two more in the works. At 62, Dafoe’s made over 100 movies, received three Oscar nominations, and worked with many of the most celebrated directors of his time, including Oliver Stone, John Waters, Wim Wenders, David Lynch, Kathryn Bigelow, Julian Schnabel, Paul Schrader, Wes Anderson, Martin Scorsese, and Lars von Trier, to name just a few. And that’s no coincidence. In an interview before sitting down Monday with Harvey Young, dean of BU’s College of Fine Arts, Dafoe said he decides which movies he wants to make based in part on who’s making them. Dafoe cited “Florida Project” as an example. Director Sean Baker had definite ideas about how he wanted to present the story of a feckless single mom living in a budget motel with her impulsive 6-year-old daughter. In person, thanks to a shaggy beard and slightly wizened features, the actor who played Jesus in Scorsese’s “The Last Temptation of Christ” still resembles, if not the Messiah, at least one of the apostles. (Or maybe it’s just a residue of playing Vincent Van Gogh in Schnabel’s upcoming “At Eternity’s Gate.”) And Dafoe has no trace of a Boston accent even though his late mother grew up in Dorchester and spoke with a heavy Hub accent. (She was a nurse at Faulkner Hospital and Mass General, where Dafoe’s father, a doctor, also worked.) Dafoe’s parents had left Boston by the time he was born — he grew up in Wisconsin — but his fondness for this place is one reason his papers are at BU’s Howard Gotlieb Archival Research Center. Dafoe was, of course, asked about the issues of gender pay equity and #MeToo roiling Hollywood. He said it’s been enlightening. He also said it’s affecting how he looks at prospective projects.